Healthy Fit Goddess: Spice up your morning! Many people, like me, start their morning with a coffee. However, you can get your morning caffeine boost in a much healthier way by drinking tea! 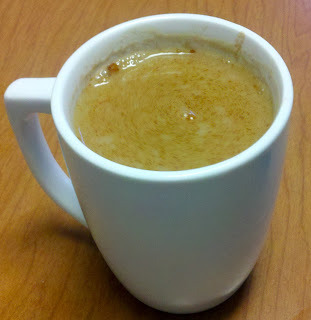 One of my favorites is a vanilla spiced chai tea latte. Black tea has lots of healthy anti-oxidants and the added spices are also good for you. I use Bigelow Vanilla Chai Tea. It's inexpensive and available at the grocery store. To make into a latte, first fill your mug about 3/4 full with boiling water. For convenience, I fill the mug with filtered water and microwave for about 3 minutes to get it hot. Next, steep the tea bag for 3 minutes and then take out and discard. Fill the rest of the mug with your milk product of choice, I use Almond Breeze - Unsweetened Vanilla. Finally, add a dash of cinnamon and mix it up! Cinnamon adds great flavor and is thought to increase circulation and open breathing, increase awareness and vitality, and reduce fatigue. a little bit of ginger is good in it too! I tried that this morning and it was great!